MONASHEE MOUNTAIN (USA) (Bay 1997-Stud 2001). 4 wins-2 at 2, Curragh Tetrarch S., Gr.3. Sire of 816 rnrs, 540 wnrs, 17 SW, inc. La Montagna (QTC Stradbroke H., Gr.1), Miss Cover Girl, Le Giare, Revelstoke, Pimpala Secret, Drenalin, Cherry Creek, Eternity Boy, Mount Verde, Don Pele, Fullandby, Jader, Kay Two, Shamoan, Rich Pearl, Dance for Us, Slater's Peanuts, SP Tibrogargan Miss, Holey Gadoley, A.J. 's Mountain, Bymonashee, Appalachian Trail, etc. DEZARIO, by Red Dazzler. Placed at 2 in Aust. This is her first foal. Victory Hotel. 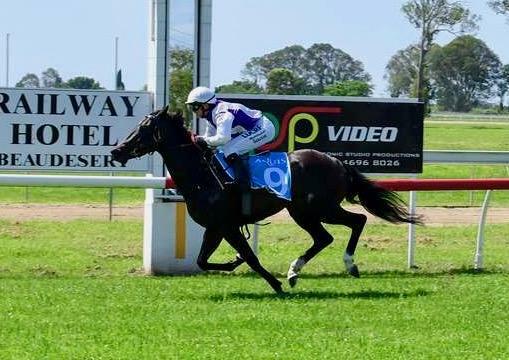 10 wins from 1300m to 1800m, A$194,400, BRC Twilight Race Day H., Rockhampton Cup. Monaco Dream. Winner at 1300m in 2016-17 in Aust. Red Hot Dream. Winner at 1000m in Aust. Trustin Dreams. Placed in 2017-18 in Aust. Rascal. 2 wins-1 at 2-at 1000m, 1500m in Aust. Velvet Knight. 2 wins at 850m, 1100m in Aust. Hooked on Platinum. Placed in Aust. No More Kisses. 3 wins to 1400m, 2d BTC Legacy H., QTC Anzac H., Paul Carter Solicitor H., 3d BTC Toll North 3YO H., QTC City Mitsubishi H., Limerick H.
Sue's Lass. 3 wins. See above. Almasea. 2 wins at 1400m, 3d BRC Vittoria H., Sequalo at Lyndhurst H., Grinders Coffee P., Hidden Dragon at Lyndhurst H., XXXX Gold H.
Lorrie's Gift. 8 wins to 1400m, A$99,893 in Aust. Easy Rolling. 2 wins at 1100m in Aust. Guilty. Winner at 1300m in Aust. MARGINS (Parameter). 6 wins from 1100m to 2100m, A$181,700, BRC Tails S., L, Canadian Club H., 2d BRC Rough Habit P., Gr.3, 3d Qld Tatt's RC Tattersall's Members' Cup, L, BRC Members' H., L, ANZA Communications H., Brazilian Beauty H., XXXX Gold Brisbane Bloodstock 2YO H.
Paper Weight. 6 wins-1 at 2-from 1200m to 2100m in Aust. Straight Shooting. 2 wins at 2150m, 2200m in Aust. Cherome. 4 wins from 1400m to 1600m in Aust. Shadiere. Winner at 850m in Aust.